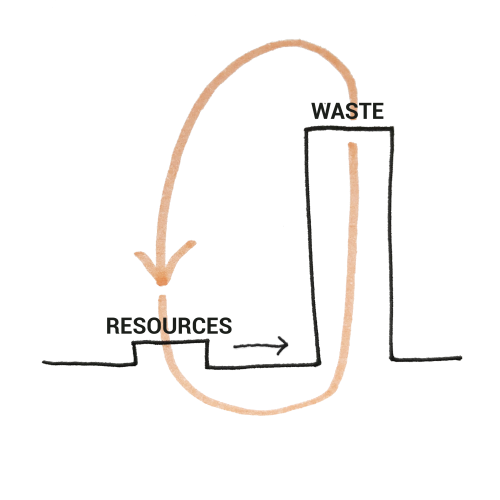 The disparity between dependence on natural resources and the surplus of waste, that characterizes urban environments worldwide, is an unfortunate condition from which we can understand the essential role of circularity. 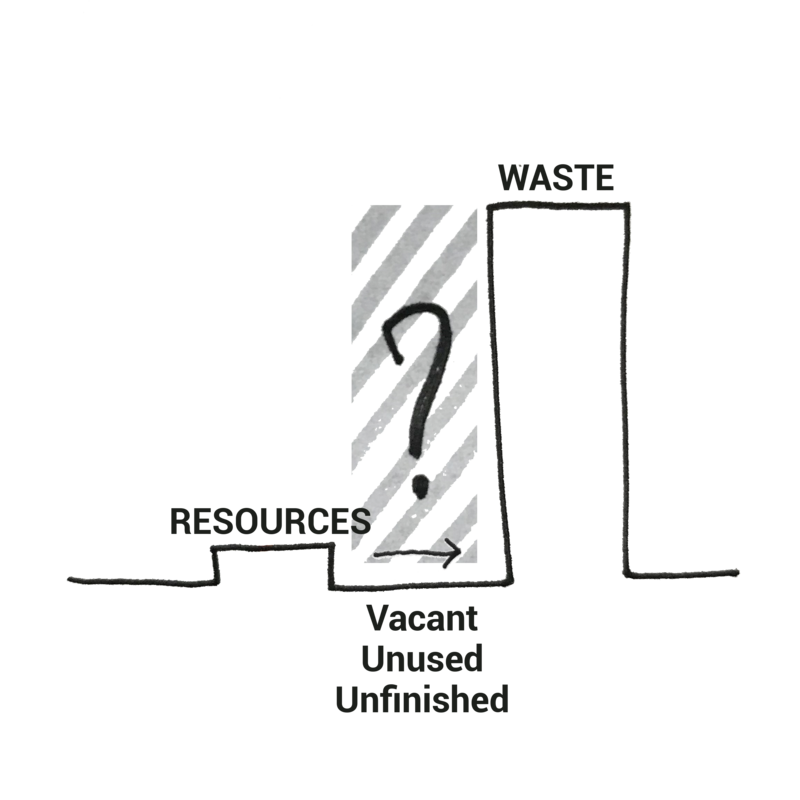 Waste can be reintroduced into the system, reconfigured as a resource and utilised in numerous sectors including design, energy, and transport. Beyond their material meaning, we can also consider resources as concepts like knowledge, expertise, activism, ideas. Likewise waste can also, tragically, mean the residual lives of disadvantaged people. Diving into cities, there are grounds to implement circular practices, and the reintroduction of waste into a wide range of resources is more or less ready. However, this depends on the awareness of holistic (material and immaterial) production systems. In pragmatic terms though, the willingness to start even from the basic principles of reduction, reuse and recycle takes for granted the operational capability to do so. What happens when the economy is blocked? 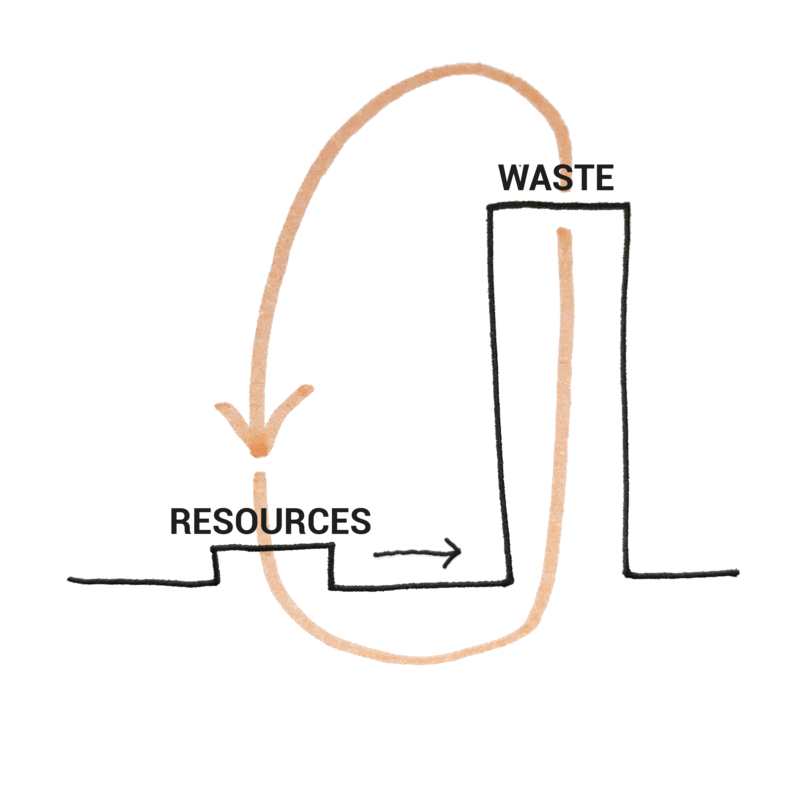 Can circularity assist in reactivating economic and social infrastructures? 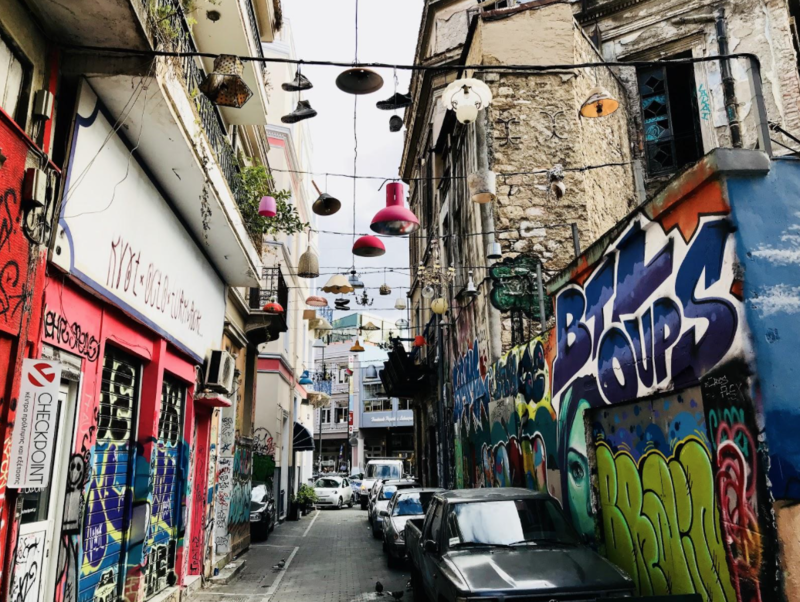 The city of Athens witnesses the effects of a prolonged economic deadlock and offers a precious insight, highlighting the importance of circular policies in times of crisis. 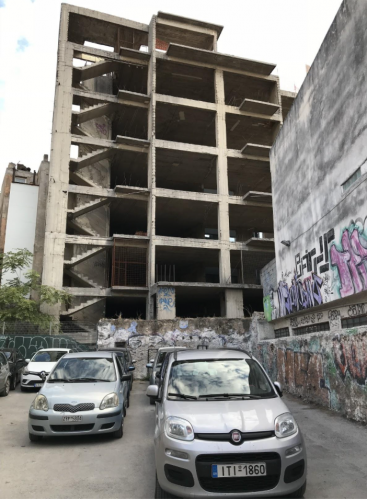 All the unfinished concrete skeletons scattered throughout Athens are almost emblematic of the economic crisis that Greece has been experiencing since 2008. Instinctively, one would find a direct cause-effect relation between the collapse of the economy and the stagnation of the construction industry: no money, no building. Yet the number of unfinished and vacant buildings is surprising and it does suggest a deeper reflection: whereas now the construction sector is agonizing, it must have been running on a high speed lane before. In fact, the crisis could generate such a sharp contrast because of a crucial fragility in the building policies up until the collapse of eight years ago. written up in the early ‘30s, landowners were able to exchange their land with construction companies for part of the (future) indoor built space* free of charge. As a result, the city of Athens was shaped through such private initiatives in an apparently win-win situation: landowners found themselves with houses to sell and rent at no cost, and companies found themselves with buildable plots at no cost. The construction industry became a major driver in the Greek economy but, over time, this linear system based on economic speculation and intrinsic individuality has shown fragility. In fact, when the only resource sustaining the growth that is the economic capacity to build, and the univoque need to satisfy namely the private need of selling have failed, the system collapsed. Coming back to the lack of resources, we could argue that in Athens this is troubled by something that is not quite a resource or waste. A sort of ‘gray entity’ made of all the unused, vacant and unfinished buildings, heritage of the crisis. They are not ready resources, because of the need of identifying possible uses and/or to complete the construction, but at the same time they are not waste, because they do have a potential value. Spread across the city, generally large in size (medium to high-rise buildings), and in the majority of the cases are private property. These characteristics suggest that a possible and effective action for their reuse cannot rely on bottom-up initiatives, but also requires an approach at a policy level. In a city like Athens, the shameful paradox is that the high number of vacant houses coexists with the increasing rate of homeless people, due to poverty and to the effects of the refugee crisis. A new policy for collective urban formation is needed. A policy where the State does not leave it to contractors, but rather promotes cross-collaboration among the citizens, the municipality and all those who (should) have the right to the city. While at a policy level, the Greek government has been busy dealing with the survival of the country, some spontaneous initiatives for reuse, sharing and production arose, and they are strengthening the solidarity among citizens at the local level. At the survival level, there are examples of initiatives for providing food at fair prices which is hugely beneficial for those who take advantage of them. One such initiative in Athens is the Other Human, a mobile social kitchen that offers homeless people the opportunity for collective cooking and eating. Continuing onto the spatial use level, the public sphere is quite an immediate ground for the reappropriation of unused (open) spaces to implement recreational and gathering uses. 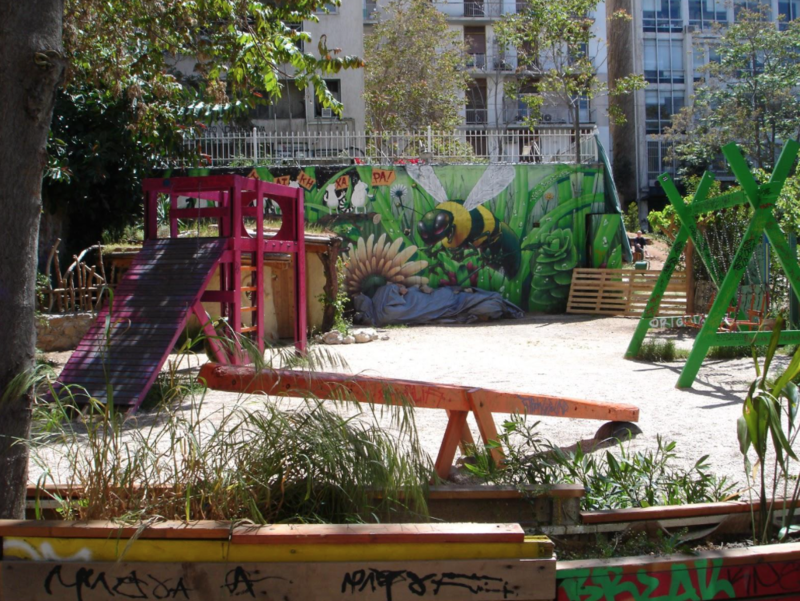 The Navarinou park, a former abandoned car park was turned into a neighborhood garden is one such example. But the more we scale up to bigger scale and private properties, the more difficult this spontaneous solidarity find its legal recognition. Coming back to the ‘grey entity’, we can find examples of self-initiated building occupation for shelter and social care but they are controversial in their legal framework. Therefore, they remain isolated cases that cannot operate in the larger network as appropriations of those vacant and unfinished buildings. An emblematic case is the Best Hotel in Europe, an hotel in the center of Athens that, after standing closed for 6 years, has ultimately been occupied to serve as a shelter for refugee accommodation and solidarity space. All activities are run uniquely on a voluntary basis and depend exclusively on donations with no State funding nor recognition. The value of the above mentioned examples is immeasurable. At the same time, relying on self-initiatives is simply not enough for a systemic improvement. Self-organizations deserve to act in an environment that promotes circular policies, meaning the reintegration and intertwining of built resources and the immense social capital. There is the need for new business models, for the City to encourage the use of the urban environment and for educational programs to raise awareness around the benefits of circularity, not only for the individual but collectively. To avoid unsuccessful top-down approaches, circular policies surely need foundations, rooted in citizens empowerment, mutual exchange, a sense of collectivism, and a culture of sharing. 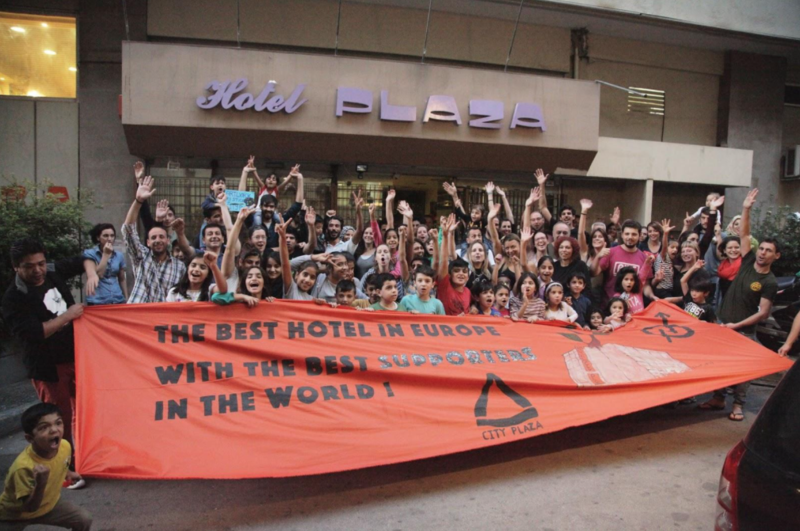 In these terms, the city of Athens seems to be preparing this ground: reactions to the crisis period can be found in the many examples of solidarity which surely is one of the fuels of circularity. Substantial policies are paramount. In fact, the bridge of the two can be solidarity, intended not only as an act of kindness, but broadly as a union for common responsibilities and interests.